Delegate: Mr. Trevor Raggatt , Department of Energy and Climate Change (DECC). 2018 saw extensive operating hours and generation from several bottom-fixed and floating tidal devices with multi-GWhs of generation being clocked up. Wave energy technology has progressed with a number of large-scale laboratory and offshore tests having been undertaken to validate innovative concepts. This activity has been supported by a set of positive Research and Development (R&D) and industrial policies, however a dedicated revenue support for ocean energy is required to establish a route to market. This issue is being investigated by the new Marine Energy Council, formed in 2018, intended to be the unified voice of the sector to engage with Government and other stakeholders to secure support. This is being supported by the ORE Catapult’s ‘Tidal stream and wave energy cost reduction and industrial benefit’ 2018 report, which highlights the significant potential economic and employment benefits from ocean energy to the UK. 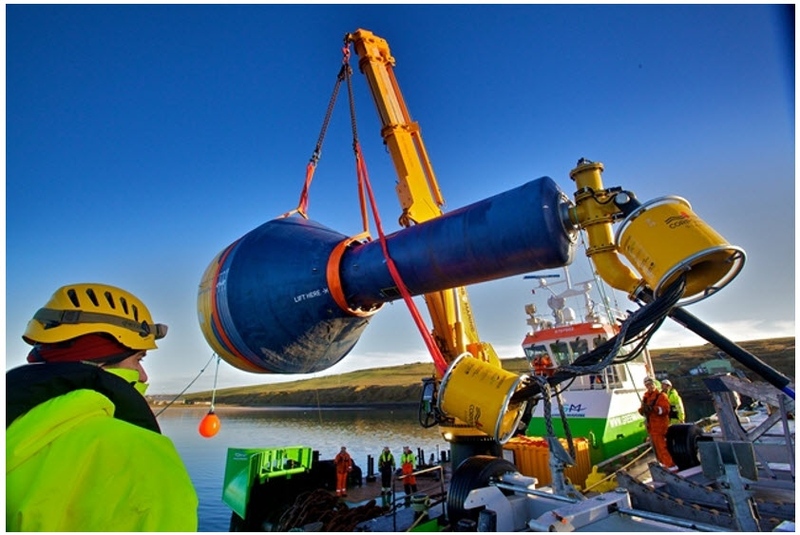 Wave Energy Scotland (WES) continues to be the focus for wave energy R&D activity in the UK in terms of funding provision for wave energy innovation and demonstration. The technology sub-system R&D streams are now maturing with the best of these to be integrated and tested at the European Marine Energy Centre (EMEC) with two part-scale wave energy devices planned for 2020 deployment. Marine Power Systems, CorPower and Wello Oy successfully deployed and tested their devices in UK waters during 2018. Tidal stream projects made significant strides in demonstrating performance and reliability. SIMEC Atlantis’ (formerly Atlantis) four-turbine 6 MW MeyGen project has now clocked up over 10 GWh of generation with maintainability also demonstrated through recovery and reinstallation operations. The Nova Innovation three-turbine 0.3 MW array has continued to operate and with the integration of a Tesla battery system, it is now able to provide continuous power to the local grid. Orbital Marine Power (formerly Scotrenewables) enjoyed a long production run of the floating SR2000 2 MW device, achieving 3 GWh of generation. All have continued working on technology improvements and planning project expansions. The 2017 UK Government strategic review of tidal lagoons established that the 320 MW Swansea Bay tidal lagoon would serve as a “pathfinder” project for the sector subject to value for money for the UK taxpayer. The project was seeking a 35-year power price contract plus significant investment by the Welsh Government. In 2018, the UK Government concluded that this represented poor value for money, the costs believed to be much higher than alternative sources of low carbon power, so would not agree these terms. The project developer is seeking alternative funding models that can address this. The UK Government’s department for Business, Energy and Industrial Strategy (BEIS) retains overall responsibility for energy policy in the UK although powers related to planning, fisheries and the promotion of energy efficiency have been devolved to the governments of Scotland, Wales and Northern Ireland. Flagship strategic policies of BEIS are having the greatest direct impact on the development of marine energy within the UK. The 2017 UK Government’s Clean Growth Strategy states that ocean energy technologies “could also have a role in the long term decarbonisation of the UK, but they will need to demonstrate how they can compete with other forms of generation.” A progress update for this strategy was published in October 2018 and makes reference to the sector deal made with offshore wind and additional funding granted to the ORE Catapult. The UK Government’s Industrial Strategy supports the development of the energy sector with ‘clean growth’ one of the four ‘Grand Challenge’ themes underpinning the strategy. The key revenue support system for renewables, including marine energy, is the contracts for difference (CfDs) - also the responsibility of BEIS. To date, the UK has invested an estimated £508m of private funds into the development of ocean energy technology. This has been supported by £70m of direct public support to technology developers, part of £300m of wider public support (including academia and test centres). To inform budget setting for 2019 onwards the UK Government has convened the Energy Innovation Needs Assessment (EINA) process. This coordination activity will bring together UK Government funding agencies from across the UK to prioritise and allocate R&D investment between the low-carbon technologies, including ocean energy. UK organisations continue to benefit extensively from European R&D funding with the UK ocean energy sector receiving over €60m from the FP7 and Horizon 2020 programmes, a figure four times higher than the next recipient nation. The Scottish Energy Strategy defines the ambitions for the sector through to 2050 also taking a whole-systems approach to the progression towards the equivalent of 50% of heat, transport and electricity consumption sourced from renewable sources. This will enable delivery of Scotland’s flagship Climate Change (Scotland) Act 2009 to reduce Scotland’s greenhouse gas emissions by 80% by 2050. Wave and tidal projects account for 0.02 GW of the total 21.3 GW renewable capacity in Scotland. Marine Scotland is the Directorate of the Scottish Government responsible for the management and use of Scottish seas, including planning and licencing of marine energy projects. This is administered within the scope of a 2015 National Marine Plan, intended to ensure sustainable use of Scotland’s seas and the resources therein. A 2018 refresh of the Plan focussed mainly on enabling offshore wind development. The Scottish Government continues to support the ocean energy sector including ongoing funding of Wave Energy Scotland. Through targeted innovation projects and research activities, several new funding awards were made in 2018. In April 2018, Crown Estate Scotland passed its one-year operative milestone since the Crown Estate’s management duties in Scotland were transferred to the Scottish Government. Managing seabed rights for renewable energy interests from the foreshore to 200 nautical miles (nm), Crown Estate Scotland has an important role to play in enabling marine energy. Applications for ocean energy projects of up to 30 MW are accepted at any time. ‘Energy Wales’ was published by the Welsh Government in 2012, and outlines how the Welsh Government intends to grow Wales’ economy in the long term through energy job creation and community benefit from energy infrastructure projects. The Welsh Government has a 70% renewable electricity mix contribution target by 2030, a proportion of which will come from marine sources. To achieve this, the Welsh Governement has allocated £100m of EU structural funding to the Welsh European Funding Office Marine Energy Fund. Delivery of this ambition is being coordinated by Marine Energy Wales, a public organisation, which guides a cluster of technology developers, research institutions, supply chain and the public sector bodies. Its primary objectives are the creation of a successful ocean energy industry in Wales through guidance, collaboration facilitation and public promotional activity. Infrastructure under development includes two wave and tidal stream Demonstration Zones and other test facilities including the Marine Energy Test Area, Morlais Tidal Demonstration Zone and Pembroke Dock Marine. Skills and innovation are being supported by the Marine Centre Wales, which opened in 2018 with £2.8m funding, and the Marine Energy Engineering Centre of Excellence. Northern Ireland’s energy strategy lies within the Department for the Economy (DfE). The DfE has published a vision to 2050 in their Sustainable Energy Action Plan 2012. Related to this, the Strategic Energy Framework 2010-2020 describes a vision of a Northern Ireland powered by affordable, sustainable and low-carbon renewable electricity. Within this Framework sits the Offshore Renewable Energy Strategic Plan (ORESAP) 2012-2020, which also applies to ocean energy. In 2018, Northern Ireland has progressed the development of a Marine Plan, which aims to maintain a ‘healthy marine area which is managed sustainably for the economic, environmental and social prosperity of present and future generations’. The Marine Renewables Industry Association (MRIA) supports the development of technology in wave, tidal, floating wind and hybrid generation across both Northern Ireland and the Republic of Ireland. In late 2018, MRIA published the ‘Discussion Paper on the Marine Spatial Planning Needs of the Marine Renewables Emerging Technologies’ to support the development of the Marine Plan. Regional development agency InvestNI continues to support the sector with a particular focus on finding matches between the sector and the Northern Irish supply chain. The UK Government continues to offer revenue support to a variety of renewable energy technologies through the Contract for Difference (CfD) programme. Based on top-up payments to a strike price, CfDs offer long-term price stabilisation and are awarded via competitive auctions. The Clean Growth Strategy and Budget has confirmed that the £557m remaining in the former Levy Control Framework (LCF) will be allocated to further CfD auctions to 2020, with the next auction planned for early May 2019. Ocean energy technologies are within the “less established” technologies category as part of the CfD auctions, which also includes offshore wind and advanced conversion technologies. Ocean energy technologies have yet to gain a CfD through the competitive auction process. There was no CfD auction in 2018. The third round of auctions, worth £60m, will open in May 2019. 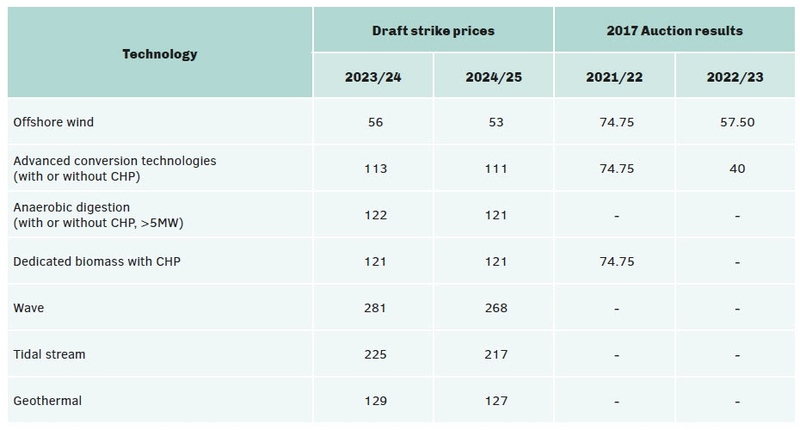 Draft strike prices of £281/MWh for wave and £225/MWh for tidal stream were quoted for projects due to deploy in 2023/24 in the BEIS 2017 Draft Allocation Framework. These are shown in the table below, compared with the 2019 draft strike prices for other generation technologies in the “less established” category and the 2017 CfD second round of auction results. Despite defining strike prices for wave and tidal, without a ring-fenced budget for these technologies it is not expected that they can gain a CfD in a competitive auction. In operation since April 2018, UKRI brings together seven research councils to support and coordinate research and innovation in the UK. Independently chaired, UKRI has a £6 billion budget funded primarily through the Science Budget by Business, Energy and Industrial Strategy (BEIS). The research councils and bodies operating within UKRI are the Engineering and Physical Sciences Research Council (EPSRC), Innovate UK, Arts and Humanities Research Council (AHRC), Biotechnology and Biological Sciences Research Council (BBSRC), Economic and Social Research Council (ESRC), Medical Research Council (MRC), National Environment Research Council (NERC), Research England, and the Science and Technology Facilities Council (STFC). Innovate UK is a funding body that supports businesses in their development of new technologies and concepts, helping them to reach commercial success. Innovate UK awards grant and loan funding across all sectors to business-led and high-value innovation in the UK. The organisation also cultivates networks between innovators and investors, researchers, other sectors, policymakers and future customers on a domestic and international scale. Innovate UK is also a member of UKRI. WES – fully funded by the Scottish Government – is taking an innovative and unique approach to the development of wave technology in a research programmes. WES funds the progression of innovative technology to commercialisation through stage-gate funding. Three levels of calls fund projects through initial to prototype testing stages. Funding is allocated within four categories of technological requirements, concerning internal components, overall WEC design, materials and manufacturing. This section contains an overview of the primary research institutions and their core project activity in 2018. Set up in 2001, the wave and tidal Hub of Supergen - Sustainable PowER GENeration and supply - Programme delivers sustained and coordinated research into the development of the ocean energy sector. Supported by EPSRC through calls and Centres for Doctoral Training, the programme has resulted in greater collaboration between academia, government and industry, the creation of new strategies and innovation programmes and provided an opportunity for international collaboration. Running from 2003 until 2018, the Supergen UK Centre for Marine Energy Research (UKCMER) sought to engage developers, industry, academia and other stakeholders to conduct fundamental and applied research that accelerates deployment of ocean renewable energy. Supergen UKCMER culminated in this capacity in December 2018 after 15 years of operation. The Centre held an assembly in Edinburgh to close down the long-running project and to introduce its successor, the Supergen Offshore Renewable Energy (ORE) Hub. Supergen UKCMER was funded by the EPSRC and coordinated by the University of Edinburgh. The Supergen ORE Hub is coordinated by the University of Plymouth and now consolidates offshore wind research activity with that of wave and tidal. The Hub launches in early 2019, and will bring together research institutions across the UK to align activity, progress the sector to ambitious levels and cultivate a ‘research landscape’ – a justified and collaborative interactive map of sector needs from a technological, funding and ecological perspective that will be available for public consumption. ORE Catapult is the UK’s flagship technology and innovation research centre, combining excellent research, development, demonstration and testing facilities with leadership, industrial reach and engineering expertise. ORE Catapult accelerates the design, deployment and commercialization of renewable energy technology innovation. ORE Catapult owns and operates over £250m of test and validation facilities including a 7 MW offshore wind turbine, a 100m blade test facility, a 1 5MW drivetrain test facility, subsea docks and HV electrical labs. By the end of financial year 2017/2018, ORE Catapult had supported 410 SMEs, participated in 196 R&D projects, and engaged in 301 academic collaborations and 628 industry collaborations. This section outlines a selection of projects carrying out R&D activities in the UK in 2018. The projects presented do not form an exhaustive list but an overview of the UK’s contribution to the progression of the sector. Critical to enabling deployment of wave and tidal devices, especially those under R&D, is the provision of offshore test centres and demonstration zones. Several of those have seen devices being deployed and tested in 2018 whilst others are an earlier stage of development. A selection of these facilities is described below. EMEC is a UKAS accredited test and research centre focusing on wave and tidal power development. 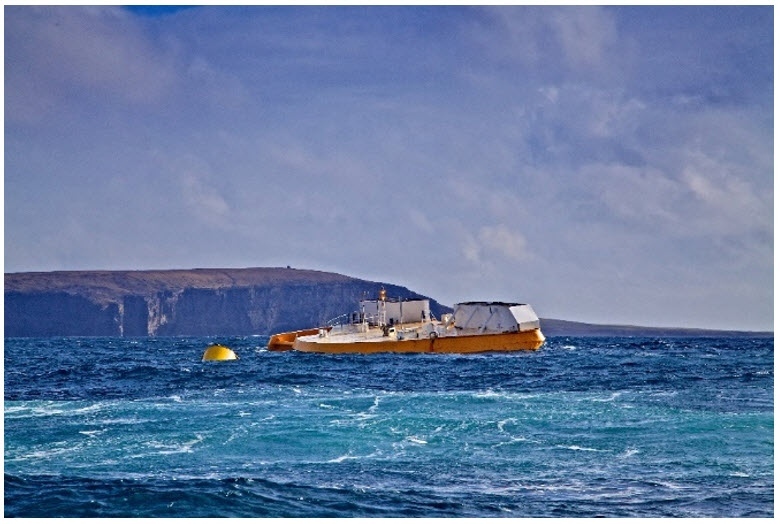 Based in Orkney, an archipelago in the north of Scotland, EMEC has thirteen open-sea grid-connected test berths and two scaled test sites. Established in 2003, the centre provides a wide variety of test conditions, with a depth range of 1 to 51 metres and significant wave height average of two to three metres. A diverse environment allows testing in a multitude of seabed and shoreline contexts, and water-depths. Wave Hub is a pre-installed grid connected site approximately 10 nautical miles (16 km) off the north coast of Cornwall for the testing of large-scale offshore renewable energy devices. The site has a Section 36 electricity consent and holds a 25-year lease for eight square kilometres of seabed divided into four separate berths. Wave Hub is owned by BEIS and operated by Wave Hub Limited. FaBTest is a 2.8 km2 test site at Falmouth Bay in Cornwall. The relatively sheltered location of the bay allows for smaller and concept devices and components to be tested. The pre-consented site, leased from the Crown Estate, has a six-metre tide range and six- to nine-metre significant wave height variance. Marine Energy Wales are establishing a new test area in the Milford Haven Waterway in Pembrokeshire. The Area will comprise of a variety of sites with consent and grid connection, which will facilitate testing at component, sub-assembly and single-device stages. Development of the site will be informed by strategic advice provided by established test-centres EMEC and Wave Hub. The site in West Anglesey was primarily for its tidal resource and access to local infrastructure. Areas within the 37 km2 site are being sub-let for test and demonstration activities alongside some of the first array scale commercial projects. This is a £33 million project, which has recently been awarded £4.5m of EU and Welsh Government funds. Developers planning projects there include Orbital Marine Power. This section is a non-exhaustive list of key projects tested, installed in the sea and operating in 2018. The MeyGen array is owned and operated by SIMEC Atlantis Energy in Scotland’s Pentland Firth. In December 2018, the MeyGen project confirmed it has surpassed 10 GWh of generation onto the grid since project commencement. Around this time, the remaining two, of four, turbines were successfully redeployed following modification work in winter 2018. 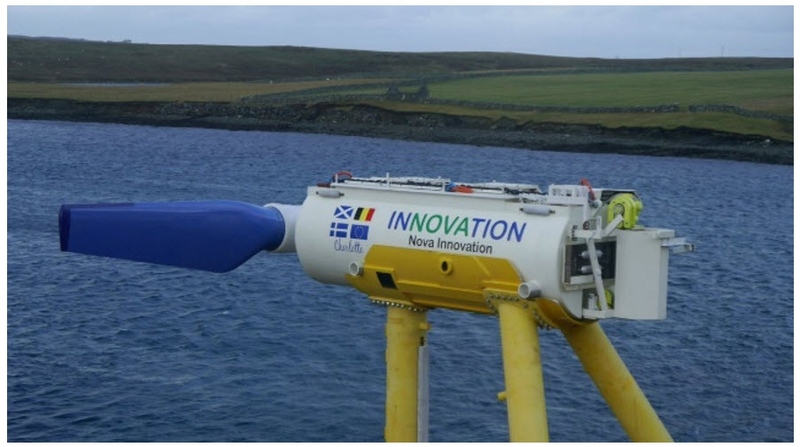 Nova Innovation was granted an extension to their existing seabed lease by Crown Estate Scotland, significantly increasing capacity from 500 kW to 2 MW. This extension will enable Nova to progress their EnFAIT project with the installation of three additional Nova M100 turbines, each rated at 100 kW. This installation will double the generating capacity deployed at the site and increase the number of turbines in the water from three to six. In October 2018, Nova Innovation installed a Tesla battery in the Shetland Tidal Array to create the world’s first baseload tidal power plant, capable of providing predictable, controllable and renewable power to the grid. CorPower deployed their half-scale C3 device and demonstrated 18 months of combined dry and ocean testing, completing the Stage 3 demonstration programme mid-year at EMEC Scapa Flow scale test site. EMEC oversaw testing in dry and wet conditions and provided verified quality control and assurance services at each stage. In partnership with EMEC, CorPower will feed the results from these tests into their WaveBoost project, improving their upcoming technology developments. Swansea-based wave developer Marine Power Systems (MPS) built their 10 kW WaveSub device in Pembroke Dock and are currently finalising tests in FaBTest, Cornwall. This was a £5.5 million project, which has received £3.5 million WEFO & Welsh Government funding. More recently, MPS are underway on the next phase of the WaveSub development, which will also be built in Pembrokeshire. Tidal developer Orbital Marine Power continued testing of their first full commercial scale machine, the SR1-2000 2 MW twin rotor floating tidal turbine at the site. In 12 months of continuous operation, the machine supplied 3 GWh - at times over 25% of the electricity demand of the Orkney Islands. 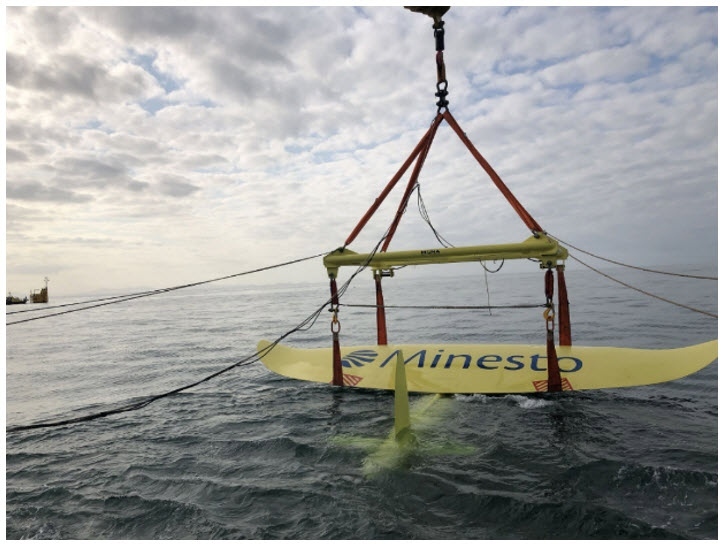 In 2018 Swedish tidal developer Minesto built and deployed their commercial scale DeepGreen500 tidal kite off Holyhead, North Wales. This project was supported by €13 million of European Regional Development Fund through the Welsh Government. Testing of the DG500 will continue in 2019. At EMEC’s Billia Croo test site, Wello Oy’s Penguin WEC marked its first year of deployment in March 2018 and continues to demonstrate survivability in weathering a number of storms and waves of over 18 metres. This section contains a non-exhaustive summary of wave and tidal projects expected to be deployed in 2019 and early 2020. Bombora Wavepower: Australian wave energy developer Bombora Wavepower set up their EU headquarters in Pembroke Dock, Wales at the end of 2017 and is now conducting a £20 million project to construct and test a 1.5 MW wave device off the coast of Pembrokeshire. Bombora secured a £10.3 million ERDF grant to support this project and now have a team of 18 staff based at Pembroke Dock. Laminaria: Laminaria’s 200 kW LAMWEC wave device will be deployed at EMEC’s Billia Croo site in 2019. The surge point-absorber device’s design includes a bespoke storm protection system, which will maximise survivability and optimise operability in all weathers. This has benefitted from MaRINET2 and FORESEA funding for test site access. Wello Penguin: Wello’s next generation Penguin WEC was deployed in Tallinn, Estonia throughout 2018 and will be relocated to EMEC for deployment next to the existing Penguin WEC in 2019. In November, a marine licence was granted for the installation, operation and decommissioning of the three-WEC array and the subsea hub at EMEC. Ultimately a three-device farm will be tested at EMEC. Instream Energy Systems: Manufactured and constructed by Leask Marine, Instream Energy Systems will deploy their surface floating tidal platform at EMEC in 2019. The 100 kW device will be the first tidal platform to be constructed at EMEC. The project is funded by Innovate UK’s Industrial Strategy Challenge Fund. Magallanes Renovables: Magallanes Renovables have completed construciton of their 2 MW floating tidal device and during 2018 it was located to Orkney. Final commissioning and installation will take place during 2019 at EMEC’s Fall of Warness test site. Nova Innovation: Nova Innovation plan to install three more M100 100 kW turbines alongside the three turbines currently in place at Bluemull Sound in Shetland. The first will be deployed in 2019 with the remaining two planned for installation in 2020, for extended operation and to understand array interactions across the six-turbine array. Orbital Marine Power: In 2019 Orbital Marine Power will design and build their optimised production model, the Orbital O2 2 MW, for deployment at EMEC in 2020. The Orbital O2 is funded under Horizon 2020 FloTEC (Floating Tidal Energy Commercialisation), with funding from Interreg North-West Europe ITEG (Integrating Tidal Energy into the European Grid) for the moorings and actuation system. Orbital Marine Power also received £7 million of peer-to-peer Abundance investment in October 2018 to build the production model. 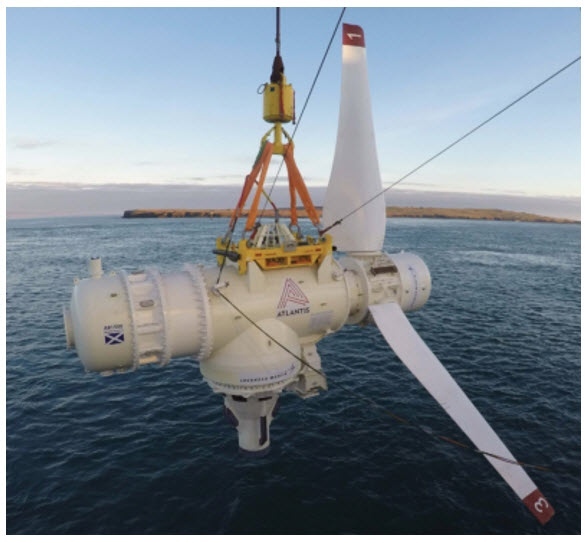 SIMEC Atlantis Energy: Project Stroma/Phase 1B of SIMEC Atlantis Energy’s MeyGen project is to install an additional two Atlantis turbines uprated to 2MW each using larger diameter rotors and more powerful generators. Deployment is planned for late 2019 at the earliest subject to consents and funding with €16.8 million revenue support package already secured under the European Commission’s NER300 programme. Project Stroma will lead into further phases of expansion up to about 400 MW of generation. Tocardo: As part of the Horizon 2020 funded InToTidal project Tocardo’s Universal Foundation System (UFS) floating tidal platform is planned to be deployed for testing at EMEC in 2019. The platform is capable of integrating five-turbines. While testing of the platform will initially use Tocardo’s turbines, the platform is intended to provide a generic solution viable for any turbine model. In 2018, the industry formed the Marine Energy Council as to engage with the UK Government and other stakeholders in a unified manner. The council is made up of representatives from the industry including those from Renewable UK, Scottish Renewables, Marine Energy Wales and the Offshore Renewable Energy Catapult, plus members from technology and project developers, supply chain companies and consultants. Throughout the year, the industry has engaged with a number of parties to develop a suitable benefit case for the support by the UK Government of marine energy through new revenue support models aligned with its industrial strategy, bringing investment, export opportunities and jobs to the coastal communities where the sources of marine energy can be accessed. Marine Spatial Planning (MSP) policy exists in UK but it is used as a decision making tool currently only in the East of England Inshore and Offshore areas. An interactive tool – the Marine Information System - explains how marine plans apply to different marine sectors and geographic areas. It highlights policies that apply to a chosen area to inform plan users (available at: http://mis.marinemanagement.org.uk/). Eleven marine plan areas will have a marine plan with a long-term (20 years) view of activities and will be reviewed every 3 years. There will be ten marine plans as the North West will have a single plan following requests to have a single process and one plan for these areas. All marine plan areas are scheduled to have a plan by 2021. The Crown Estate carries out periodic tendering processes for wave/tidal areas. These areas are scoped and Strategic Environmental Assessments (SEA) carried out. • National Resources Wales (NRW). In English and Welsh offshore waters, marine licenses, section 36/A consents, and safety zones are determined by the MMO. In Welsh inshore waters, marine licenses are determined by the NRW and section 36/A consents and safety zones by the MMO. Decommissioning of offshore renewable energy installations is regulated by the Department of Energy and Climate Change (DECC). An Environmental Impact Assessment (EIA) is assessed on a case-by-case basis. Assessment is based on the size, nature, and location of each proposal as directed by Annex II of the Marine Works (Environmental Impact Assessment) Regulations 2007 or Schedule II of the Electricity Works (Environmental Impact Assessment) (England and Wales) Regulations 2000. The Marine Management Organization (MMO) is responsible for providing a decision on whether an EIA is required or the applicant can voluntarily opt in to the process. The Environmental Statement (ES) will be submitted at the application stage for a marine license. However, draft ES chapters may be reviewed by the MMO and its technical advisors at the pre-application stage. • The Electricity Act 1989 (Requirement for Consent for Offshore Wind and Water Driven Generating Stations) Order 2011. • Electricity Act 1989 for section 36 consents and safety zones. Consultation process is initiated after the initial checking of the application. This is done primarily through the online portal Marine Case Management System (MCMS) but also by email to other consultees as appropriate. There are statutory consultees stipulated in either the Marine and Coastal Act 2009, the Marine Works (Environmental Impact Assessment) Regulations 2007 or Electricity Works (Environmental Impact Assessment) (England and Wales) Regulations 2000. Consultation in taken on a case-by-case basis. There are no informal consultation activities implemented during the licensing process. The MMO have a Key Performance Indicator (KPI) target of 13 weeks to make a determination on a marine license application from when it is received with us. There is no such KPI for 36 consents or safety zones. Information about what permits are required, in what order and what information must be supplied at what time is available at a dedicated web link. Usually deployment in designated test centers are already pre-consented so developers do not have to submit a full application comprising all the typical consents providing certain initial conditions are met. This is the approach encouraged for applicants to adopt in order to streamline the consenting process for the deployment of demonstration devices.